This scenic hike is among the most popular hikes in North Lake Tahoe. The trailhead is on Highway 267 near the top of Brockway Summit. Brockway Summit is a 10 minute drive from Truckee or Kings Beach. The hike is 3 miles round trip with moderate climbing. This is the ideal hike if you don't have much time to spend. The view from the rock overlook is spectacular. Start the hike before 10:00am on busy weekends to avoid the crowds and for parking. Bring water and of course your camera. Most of the parking is on the south side of Highway 267, just 1/4 South of the summit. The trail starts on the North side of Highway 267 on a fire road. This is where the Tahoe Rim Trail crosses Highway 267. 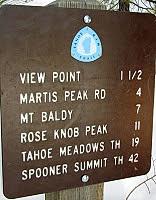 There is a kiosk with signage 100 yards up the fire road which indicates the single track trail that is the Tahoe Rim Trail (TRT). Follow the TRT uphill for approximately 1 mile where a trail cuts off to the left. The TRT continues straight, but the scenic overlook is to the left. There should be a trail marking the "Spur Trail View". Cell service is good on this hike. This trail is open to Mountain Bikes. Bikers can ride the TRT from Brockway east for 7 miles to Mount Baldy. This is so beautiful, so amazing .just wow . not just the scene but all over this is so mesmerizing . i love high mountaneous areas , who doesn't? i will visit it . i'll try my beat to get here . Between Tahoe City and Brockway Summit, the Tahoe Rim Trail meanders through groves of fir, cedar and aspen and across open hillsides covered with manzanita. The trail climbs steadily from Tahoe City into a mixed forest. Side trails and open slopes offer opportunities to explore cinder cones and ancient lava flows.